The four bells in the Purdue Bell tower have a history that stretches back more than 100 years -- to the days before Neil Armstrong, Amelia Earhart or even the dawn of the 20th century. The bells date to 1895, when they were installed in the newly rebuilt Heavilon Hall tower. The original tower was destroyed in a terrible fire just four days after it was built in 1894, and the rebuilt Heavilon Hall tower's clock and four bells were new features in the gleaming engineering structure, according to "A University of Tradition: The Spirit of Purdue," a book compiled by the Purdue Reamer Club. Cast in Troy, N.Y., the bells weigh 1,200, 600, 300 and 200 pounds. They were a gift from the Ladies Matinee Musicale in Lafayette, according to inscriptions on them. "The bells are a testament to the resilience of a campus that built a brand-new tower literally nine bricks higher than the one that burned down a year earlier," says John Collier, director of campus master planning. The bells regularly chimed in the Heavilon Hall tower until 1956. That year, Heavilon Hall was demolished and a new building bearing the same name was built -- this time for the humanities rather than for engineering. Not part of the new building's design, the bells remained in storage until 1995, when they were placed inside the new Purdue Bell Tower. The tower, which stands 160 feet tall and is made of red brick trimmed with limestone, is a modern architectural interpretation of the old Heavilon Hall tower. 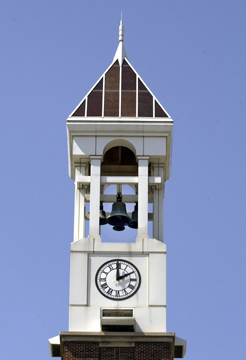 The bell tower was dedicated at Homecoming on Oct. 14, 1995. Now, electronic clappers strike the bells every hour, half-hour and at the end of classes. The tower is also equipped with an electronic carillon that plays recorded songs at various times during the day and evening and for special events on campus. "I can't think of a better way for current and future Boilermakers to be reminded of Purdue's rich and interesting history than by knowing that the peals and chimes we hear from Purdue's bell tower come from the same bells that rang out on Purdue's campus more than 100 years ago," Collier says. The bell tower's clock, although fabricated for the new structure, was modeled after the clock in the old Heavilon Hall tower. The original Heavilon Hall clock was a donation from the Howard Watch and Clock Co. of Boston. It was in storage from 1956 until 1991, when the late Jack Fessler, professor of veterinary clinical sciences, began restoring the clock. He finished in 1994, and after serving as a display in various places on campus, the working clock in 2011 found a permanent home in the atrium of the Roger B. Gatewood Wing in the Mechanical Engineering Building. More information about the old Heavilon Hall tower clock can be found here.